French fries typically require cooking twice. The first time is to cook the potato and soften it up a bit and the second time is to get a nice crisp texture and golden color. 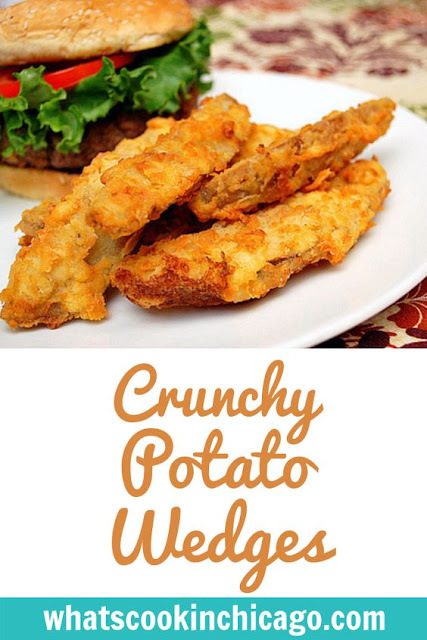 For these Crunchy Potato Wedges, potatoes are sliced, tossed with oil and spices, and then cooked in the microwave. (Yes - the microwave!) The potatoes were cooled a bit and then dredged in a mixture of flour and cornstarch. Then the potatoes get a quick dip in a mixture of buttermilk and baking soda. Another dredge in flour and cornstarch finished the potatoes before they were deep fried. 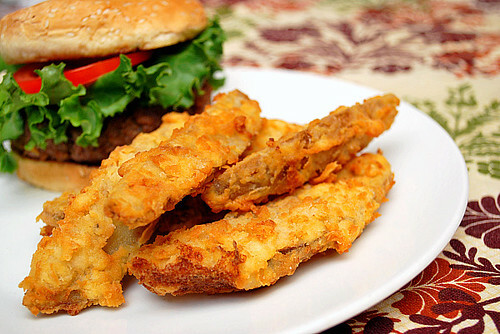 After frying, the fries got another toss in seasonings to give them an extra boost of flavor. The result is a super crispy, coated french fry that has a nice spice flavor from the seasonings used. It was a nice change of pace from the usual french fry recipe and it gave me some ideas to use the flour/batter technique with other things! Combine the salt, pepper, onion and garlic powder, cayenne and oregano in a bowl. Take 4 teaspoons of this mixture and add to a large microwave safe bowl. Add the potato wedges to the large microwave safe bowl with the 4 teaspoons of spices and toss with 1/4 cup of vegetable oil to coat. Cover the potatoes with plastic wrap and microwave on high for 7-9 minutes, until the potatoes are tender but not falling apart. Shake the bowl without removing the plastic to redistribute the potatoes halfway through cooking. Slowly remove the plastic wrap from the bowl and drain the potatoes. Arrange the potatoes on a rimmed baking sheet and cool until they firm up, about 10 minutes. Heat the remaining 3 quarts of oil in a Dutch oven over high heat to 340 degrees. Meanwhile, combine the flour and cornstarch in a medium bowl. In another bowl, combine the buttermilk and baking soda. Working in 2 batches, dredge the potato wedges in the flour mixture, dip in the buttermilk mixture and dredge again in the flour mixture. Shake off the excess flour and place on a wire rack. When the oil is ready, add half the coated wedges and fry until deep golden brown (about 4-6 minutes.) Transfer the wedges to a large bowl and toss with 1 teaspoon of the spice mixture. Drain the wedges on a baking sheet lined with paper towels. Return the oil to 340 degrees and repeat with the second batch of wedges. Serve with extra spice mixture on the side. I love potato wedges and yours look so tasty. That crunchy coating gives them a great look. Oh man. This looks amazing. I remember stumbling on your blog ages ago before I had my own. I made your beef bourguignon and what a hit it was! I'm definitely thinking of giving these a go! Now these look tasty! I'm always looking for new ways to cook simple potatoes. This recipe looks like a winner to me!